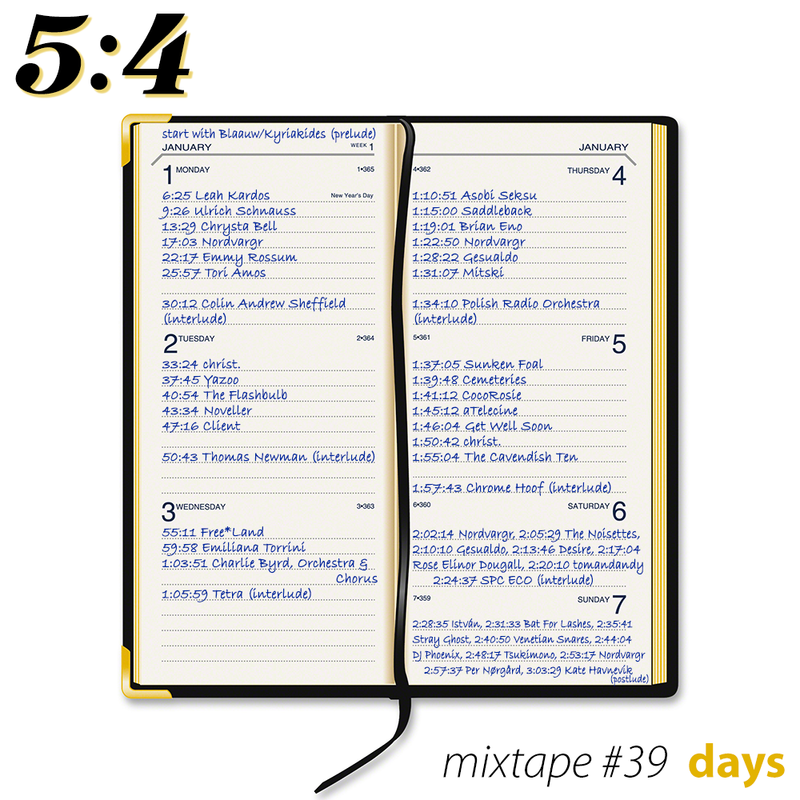 The new 5:4 mixtape takes as its theme the days of the week, charting a slow progression from Monday to Sunday. 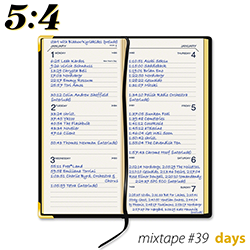 That might not sound like a particularly promising theme, but i’ve been noticing in recent months just how many tracks in my music library contain either specific or more general references to days, which led to the idea for this mixtape. Perhaps unsurprisingly, due to it being (from an aural perspective) such an abstract concept, the music in this mixtape is more than usually eclectic, but once i again i’ve been able to navigate what i think is a convincing, interconnected sonic pathway through exceptionally diverse material. This exercise was revealing in the extent to which some days of the week have received a greater amount of musical attention, while others are much more neglected. This clearly has more than a little to do with our cultural experiences and exploits: plenty of music to choose from for the weekend – when we’re more likely to be away from work, enjoying ourselves – while Tuesday and Wednesday in particular provided relatively few options (though good ones). 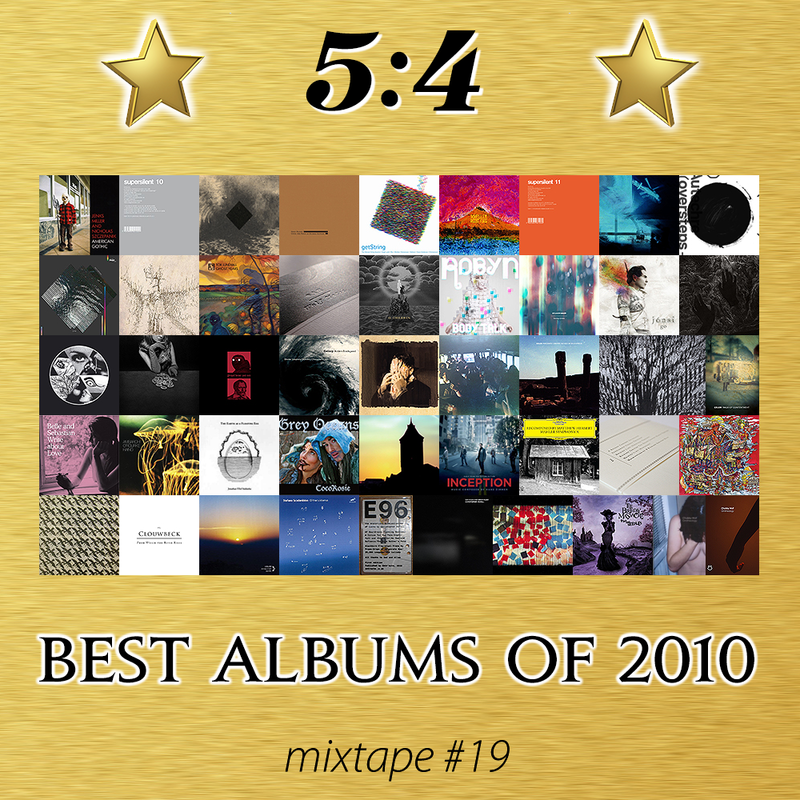 Once again, the mixtape includes some of my favourite music, old and new, and i’ve divided it up into sections for each day, demarcated with interludes. A couple of composers appear several times: there are various excerpts from Nordvargr‘s 8-hour epic Sleep Therapy and some pieces from Gesualdo‘s Tenebrae music. i’ve drawn on my love of easy listening on a number of occasions too, featuring some delicious slices of fragrant cheese from Charlie Byrd, Orchestra and Chorus, the Polish Radio Orchestra and The Cavendish Ten. Songs of a multitude of stylistic persuasions litter the mix, encompassing electronica (Yazoo, Client, SPC ECO, Bat For Lashes, Kate Havnevik), ballad (Emiliana Torrini, Get Well Soon), dream pop (Emmy Rossum, Tori Amos, Mitski, Desire), manic pixie dream pop (CocoRosie), light rock (Chrysta Bell, Asobi Seksu), experimental chamber rock (Chrome Hoof) and lo-fi (Leah Kardos, Rose Elinor Dougall). Devoid of words but packing diverse beats are tracks from Christ., The Flashbulb, Free*Land, Cemeteries and tomandandy. At the more abstract end of the continuum, i’ve included a range of more free-form electronics from the likes of Ulrich Schnauss, Colin Andrew Sheffield, Noveller, Tetra, Saddleback (Richard Skelton), Brian Eno, aTelecine, The Noisettes and Stray Ghost. There’s also a burst of Thomas Newman‘s luscious score for Less Than Zero and a gorgeously potent movement from perhaps Per Nørgård‘s greatest symphony (No. 6) towards the end of the mix. i’ve featured a small selection from my now vast collection of renditions of Gloomy Sunday – one of my favourite songs, about which i really ought to write a book sometime. In case it isn’t obvious, Venetian Snares and Tsukimono are reworking Billie Holliday’s classic recording, in both cases coming up with something wonderful, whereas DJ Phoenix reinterprets the song within a torrent of squelch, grime and bass. And the whole thing kicks off with a tantalising six-minute introduction from Marco Blauuw & Yannis Kyriakides. Barely suppressed abrasion is the undercurrent throughout this fruitful collaboration. The context for it couldn’t be more gentle; “Sin Killers”, for example, suspends the rough edges as in a viscous liquid. But when the noise senses freedom, it’s like a bull at a gate; at first, in “White Light”, it emerges in fits and starts, but ultimately runs amok in final track “Cranberry Sauce”, turning its exquisitely beautiful stasis into an overwhelming torrent of effluvial overdrive.